AWARD-WINNING ASCENDER PLATFORM WITH LIGHTWEIGHT ASCENDER BODYWORK: The 1.125-inch dropped driveshaft features an increased track-to-tunnel clearance of 3 inches allowing us to use 8-tooth drive sprockets on this model, giving you a flatter approach angle with more floatability and maneuverability. In addition, you’ll also notice a huge difference in your sled handling. 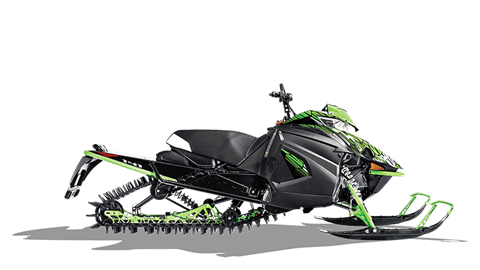 This update delivers a more efficient power transfer to the snow, letting you enjoy more horsepower when climbing, carving, side hilling and boondocking. 1.125" DROPPED DRIVESHAFT: The 1.125-inch dropped driveshaft features an increased track-to-tunnel clearance of 3 inches allowing us to use 8-tooth drive sprockets on this model, giving you a flatter approach angle with more floatability and maneuverability. In addition, you’ll also notice a huge difference in your sled handling. This update delivers a more efficient power transfer to the snow, letting you enjoy more horsepower when climbing, carving, side hilling and boondocking. ARCTIC DRIVE SYSTEM WITH TEAM RAPID RESPONSE DRIVE AND TEAM RAPID RESPONSE BOSS DRIVEN CLUTCHES: The Arctic Drive System™ features a lightweight magnesium chain case. The design incorporates a large TEAM® driven clutch and TEAM drive clutch. By eliminating belt skid, these clutches reduce temperature and transfer more power to the track. In addition to their incredible strength, these clutches are known for their easy and precise tuning. FLOAT ACTION REAR SUSPENSION: The mountain suspension on the SE is fitted with aluminum Arctic Cat (IFP) shocks. Coil-over rear shocks provide preload adjustment and unsurpassed ride quality. STEALTH LIGHTWEIGHT MASTER CYLINDER BRAKE SYSTEM: For 2019, the stealth lightweight master cylinder brake system features a lever design for increased braking power with less required force compared to the previous design. PROCLIMB - 7 G2 SKIS: The 2019 ProClimb – 7 G2 Skis feature a shape that delivers improved flotation with a slightly less aggressive keel shape for easier steering and more consistent performance in varying snow conditions. Molded-in foot traction on the top of the skis adds boot traction and usability for experienced riders. The G2 skis work in concert with the AMS spindles to deliver a level of deep-snow performance and adjustability, incorporating a tapered width, from 7 inches at the tip to 6.5 inches in the middle, which works with a unique rubber dampener to keep the ski tips up and floating on top of the snow while preventing diving or knifing. A wide ski saddle accommodates a full 2 inches of lateral ski stance adjustability. Estimated Dry - 469 lb.